On Wednesday 12 December 2012 (12-12-12) it is very likely that the ruler of Qatar, Emir Hamad bin Khalifa Al Thani, will declare open New Doha International Airport (NDIA). The occasion (and the date) will be Hollywood at its best, and had they been still around both Ziegfeld and Goldwyn would have applauded. The big difference with this show is that it is for real and not just a celluloid fantasy. Standing discretely back, and taking the plaudits of those who know, will be Akbar Al Baker, CEO of the airport and of course Qatar Airways, which he has bossed since 1997 and shaped into one of the world’s great airlines. Al Baker is a showman, hands on at all times, with enormous vision, enthusiasm and energy. Qatar’s new Boeing 787s will be seen at the opening, and no doubt an Airbus A380 too. Judging by a recent visit New Doha International Airport will be an impressive gateway and will quickly become one of the world’s finest hubs with excellent connecting facilities. AERBT has always held that the world’s best airports are those designed for at least twice the number of passengers that use them. NDIA meets that criteria easily, the central core capable of handling over 50m travellers every year. In 2011 the current airport handled 18m passengers and even without a planned extension 28m should be lost in the massive complex. Ten years ago the number was 4.4m. Whilst of a fleeting nature the existing airport, including its Premier Terminal exclusive to Qatar Airways, is a world leader, US$100m being spent on what is a short-term high-class remedy to a serious potential overcrowding problem. Elsewhere all efforts would have been diverted into the new project. Not so in Qatar. The current operation is top class in every way. The new 2,200 hectare airport has been built partially on reclaimed land 4kms to the east of the current complex allowing the flight path to take planes away from Doha itself and allowing for a 24-hour operation. The three-storey 600,000sq m terminal has 41 airbridge gates, six specifically designed for the Airbus A380, and 22 remote stands. There are more than 40,000sq m of retail facilities and passenger lounges. Careful consideration has taken place from an ecological point of view and for the future a metro operation will be added to the complex making Downtown access very easy. Within the design is scope for adding 50% more building capacity which could be ready for 2015. There are two runways 4,850m and 4,250m. Over 6.2 million cubic meters of improperly disposed household waste was removed from the site and disposed of properly in an engineered landfill. This is the largest such environmental programme ever in the Gulf region. To conserve energy the passenger terminal curtain walls are coated to reduce solar exposure, the roof overhang provides shade and is insulated. The mechanical systems include CO2 sensors to regulate air intake based on occupancy. The electrical arrangement has daylight monitoring and occupancy sensors. The landscaping uses desert-adopted species and irrigation water from recycled waste water. 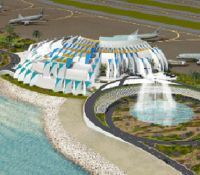 From an airside view it is the Emiri (Royal) Terminal that stands out with its elegant sail design and unique architecture. The facilities include private quarters for the noble family, press and business centres, and significant security features. The main entrance overlooks a spectacular lagoon with distinguished water features. For VIPs with their own aircraft the Emiri Terminal includes a separate private area with passport facilities and security. There are positions for up to seven aircraft and two airbridges. Close by is the aircraft maintenance centre with a hangar that can accommodate up to 13 aircraft at any one time including the Airbus A380. A general aviation hangar and facilities are provided for and a massive cargo facility with a capacity of 1.4m tonnes a year including 11 apron positions. The main passenger terminal reflects its ocean-side setting, the roof wave-like in structure. The transparent façade of the terminal beneath, further emphasises its curves. 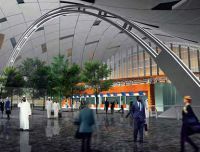 Inside the terminal, the design focus has been on the creation of a spacious, but efficient and convenient airport experience. The result is a multi-level building with arched columns, skylights and highlighted finishes that truly enhance the feeling of space. With short walking distances between gates, and shorter connection times between flights, the airport says passenger waiting and walking times are minimised, all helping to ensure an effortless experience within the facility. The extensive central area has been designed for duty free, other retail, food and beverage, amenities and airline lounges. All departing passengers will walk through this area. The terminal will also have a 100-room transit hotel with health and entertainment facilities.